From M1 (south): take junction 29, then A617 to Chesterfield, A619 Chatsworth Road to Baslow. At roundabout take second exit A623, at Calver crossroads turn right (A625), then left to Grindleford and then Hathersage. At T-junction turn left (A6187 / A625) and follow road through Hope to Castleton. From M1 (north): take junction 35, then A629 towards Chapeltown; left on to A61 Penistone Road. At Hillsborough turn right on to A6101 (Bradfield Road, Holme Lane, Rivelin Valley Road) and continue until joining the A57 Manchester Road. At Ashopton turn left across bridge (A6013) towards Bamford. At junction turn right (A6187 / A625) and follow road through Hope to Castleton. From Manchester: take the A6 Buxton Road to Chapel en le Frith; turn left on to A6187 / A625 to Castleton. From Stoke-on-Trent: head north on the A53 towards Leek, continue on A53 through Buxton. Turn left on to A6 towards Dove Holes and Chapel en le Frith, then right on to A6187 / A625 to Castleton. By Bus: First buses run service 272, pretty much hourly, connecting Castleton with Sheffield, Hathersage, Bradwell and Hope. A Sunday shuttle runs between the town and nearby railway stations at Edale and Hope, more frequently during the summer visitor season. TM Travel and Hulleys also run services, which vary according to the time of year. By Rail: There are railway stations at nearby Edale and Hope, as well as at Sheffield, Chesterfield, Buxton, Matlock and Grindleford. Airport: The nearest airports are Manchester, Robin Hood Doncaster, Birmingham or Nottingham East Midlands. Picturesque Castleton is probably the best-known village in the Peak. Dominated by the ruins of an ancient hilltop fortress, it commands an imposing position at the head of the Hope Valley. But it is the subterranean network of caverns and mines that has drawn people to the area for thousands of years. Traces of Ice Age mammoths have been found in the spectacular caves, along with evidence of Stone Age and Iron Age settlers. Later, medieval tinkers and generations of rope makers made their homes in the gaping mouth of Peak Cavern (now renamed the Devil’s Arse) – one of four show caves, the others being Treak Cliff, Blue John and Speedwell. The underworld continues to be a source of fascination: it was beneath the hills of Castleton that the UK’s largest cave was discovered less than a decade ago - although its discovery did not become public knowledge until recently. Titan, at 460ft, is loftier than the London Eye and nearly 200ft higher than the previous record-holder. Its existence finally made headlines around the world when a BBC documentary crew filmed inside the hidden depths for the first time. Dave Nixon, who led the team that discovered Titan, says 90% of caves in the area are still waiting to be found. The Castleton of today has grown up since the 12th century, when it was the centre of the Royal Peak Forest, a popular hunting ground for the nobility. Among them was William Peveril, illegitimate son of William the Conqueror, who built the original castle – thought to have been a timber structure – that gave the village its name and inspired Sir Walter Scott’s celebrated novel, Peveril of the Peak. It was later rebuilt in stone and 900 years later, it still towers above the entrance to Peak Cavern, the largest cave mouth in the British Isles. The impregnable fortress is flanked by the steep sides of Cavedale and beyond it is Winnats Pass, a formidable limestone gorge which has been the gateway to Castleton since Roman times. A less bleak and windswept route was constructed in 1809, over reclaimed spoil heaps at the foot of Mam Tor (the Shivering Mountain), but the road was notoriously unstable and finally collapsed 30 years ago. Mam Tor itself is still accessible by foot – a tough but steady climb thanks to a recently-laid pathway of flagstones – and the remains of an Iron Age hill fort can be seen at its summit, along with dramatic views of the surrounding countryside. Castleton is essentially a picture-postcard village of stone cottages clustered around a green, an old market square and along the banks of Peakshole Water. Buildings worth a visit include 17th century Castleton Hall, now a youth hostel, and St Edmund’s Church, parts of which date back to Norman times. Also unique to Castleton is Blue John stone, a type of semi-precious fluorspar named for its unusual colouring – bleu jaune in French. Found only in Treak Cliff and Blue John caverns, it has been made into jewellery, bowls and goblets which have found their way to the White House, the Vatican and even the ashes of Pompeii. The history of the stone is just one of the subjects featured at Castleton’s state-of-the-art information and visitor centre which opened in 2004. Castleton sits at the head of the Hope Valley, surrounded on three sides by steep hills. On the boundary between the Dark Peak and the White Peak, it is built on layers of gritstone and shale, resulting in instability and landslips such as the pattern seen on the scarred face of Mam Tor. The area’s cave system is created by adjoining limestone, a porus rock which has been dissolved over the years by surface water trickling through it, to form vast underground caverns and passages studded with stalagmites and stalactites. The age-old collapse of caves resulted in the dramatic gorges and passes (such as Cavedale) which surround the village. 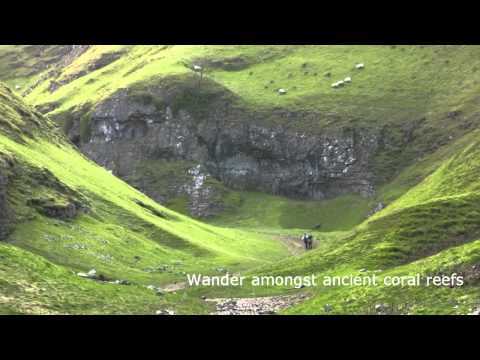 Fossil-rich limestone is also responsible for the Winnats being designated a Site of Special Scientific Interest. Castleton’s early popularity was due to its key position on the packhorse route, travelled by the ‘jaggers’ taking salt from Cheshire to Sheffield. Later the construction of a turnpike road between Sheffield and Sparrowpit made access easier and in 1894 the Hope Valley railway line opened up the village to tourists. Originally known as Castle Peak, the fortress has surveyed the surrounding hills for well over a thousand years. The early wooden structure was rebuilt in stone around 1175 and the great square keep and curtain wall still survive. Peveril is now in the care of English Heritage and is open daily for those fit enough to tackle the steep path zig-zagging up the hillside from The Stones. Recent conservation work has allowed visitors to see two previously inaccessible rooms – a medieval garderobe and another room with spectacular views. A new £350,000 visitor centre has also been created in an old custodian’s cottage. Now officially known by its old nickname, the Devil’s Arse, this ‘wonder’ of the Peak can be found at the foot of the hill. Its awe-inspiring entrance is still stained by the smoke of cottages which once huddled beneath the shelter of its arching roof. Tours take in the ropewalks, where rope was produced for more than 500 years until the retirement of 91-year-old Bert Marrison in 1975. His ashes and some of his tools are buried in the cavern. Visitors can get a glimpse of the underworld between April and October, when guides will take them deep beneath the Castleton hills to marvel at the vaults and formations. It was in an extension of this system that pot-holers discovered Titan, the largest cave in the UK. Castleton’s other show caves are Speedwell, famous for its subterranean boat trips; Treak Cliff, with its stunning stalagmites and stalactites; and Blue John Cavern, where the unique semi-precious stone is still mined. Award-winning chocolatiers Cocoadance run their cottage industry from a converted National Trust barn at the foot of Mam Tor. Owners David Golubows and Bridget Joyce run regular Chocolate Experience events, when visitors can not only see the process in action, but also have a go themselves. Finally, don’t miss the new information centre incorporating a museum, exhibitions and inter-active displays. Even the least adventurous of visitors can glimpse a hang-glider’s-eye view of Mam Tor, try rock climbing or experience the thrill of pot-holing, and a computer system ensures that everything you want to know about the Peak District is right at your fingertips. Villagers and visitors alike wear oak leaf sprigs for Castleton’s unique Garland celebrations, which take place annually on Oak Apple Day, May 29. The festival is said to echo an obscure pagan fertility rite, that was revived to commemorate the restoration of Charles II, who famously hid in an oak tree. Each year a ‘king’ and his consort are elected and a huge cone-shaped ‘garland’ is created from a wheel rim and pieces of wood, covered with bunches of oak leaves and wild flowers. A smaller wreath made from garden flowers, and known as the ‘queen’, is placed on top. The garland, weighing around 30kg, is lowered on to the shoulders of the king, who is dressed in Stuart costume. Accompanied by his consort, he rides on horseback from pub to pub followed by a procession of dancing children. The garland is later hoisted up and placed on one of the eight pinnacles of the church tower where it is left to wither, while the queen’s wreath is placed around the war memorial. The day concludes with morris dancing and singing in the market place. Castleton also holds an annual Christmas festival which attracts visitors from miles around. The village takes on a magical appeal throughout December with Christmas trees lining the streets, Santa in his grotto, children’s rides, bands playing and roast chestnuts on sale. A number of the caverns stage carol singing and brass band concerts. 2017 update ... On Saturday 18th November 2017 @ 4.30pm the Christmas Lights will be switched on. As soon as more information is available we will add to this. The hills around Castleton are a honeypot for hikers, particularly those who enjoy a challenge. The ridge westwards from Lose Hill to Mam Tor offers stunning views, or head across the plateau of the Limestone Way towards Taddington. Try this 4 mile Castleton walk that begins and ends in the village. This slightly longer (5 miles) Castleton and Mam Tor route is another very enjoyable hike. A range of activities and courses is available in the area. Losehill Hall, run by the Peak District National Park Authority specialises in environmentally-based courses: 01433 620373; Peak Activities Ltd offers training in a range of sports and activities: 01433 650345; Thornbridge Outdoor Centre activities are aimed at groups: 01629 640491; the Hollowford Centre is a young people’s development centre run by the Lindley Educational Trust: 01433 620 377. There’s no shortage of good places to eat in Castleton itself, but most of them are pubs. There’s a choice of six or seven, each with its own character and all offering food. For those who like something a little up-market, try Ye Olde Nag’s Head (Cross Street). This 17th century former coaching inn boasts home-cooked food and a good selection of real ales and malt whiskies. The tea room is an à la carte restaurant by night, with a carvery at weekends. The 1530 restauarant serves modern British and Italian food and is highly regarded by its Trip Advisor reviewers with the vast majority judging the food and service as excellent. Just round the corner is the Cheshire Cheese Inn (How Lane) with owners Karen and John – probably the village’s oldest pub, offering good food, old-fashioned charm and warm hospitality: “Muddy boots welcome”! The George (Castle Street) has home-cooked food while its neighbour the Castle is part of a chain but offers a varied menu in cosy surroundings. There’s also the quirky Peak Hotel Tel: 01433 620 247 (real ales, gin, good food, beer garden and private parking) doing well under new management (How Lane) and the Bull’s Head (Cross Street), all within a stone’s throw. There are plenty of cafés to choose from too - including the Cosy Cottage tea rooms, Rose Cottage, the Three Roofs, Dolly’s or the Cinnamon Bear craft shop (Back Street), which specialises in teddies as well as tea. And if nothing else will do, there’s always the fish and chip shop next to Castleton Youth Hostel. Regular visitors have been thrilled to discover that the Losehill House Hotel in Edale Road, Hope, opens its restaurant to non-residents – and it’s a cut above anything else in the area. Elegant surroundings and quality cuisine make this well worth a visit; expect to pay around £30 for the table d’hote. As with any tourism centre, gift shops have the monopoly, so it may not be the ideal destination for shopaholics. But Castleton has plenty to offer those who enjoy browsing and there are one or two real gems. There’s a dearth of speciality food shops – no butcher or baker – but three general stores stock most everyday items and there’s a bigger selection just up the road in Hope. Castleton also boasts its own farmers’ market which takes place in the Village Hall on the first Sunday of each month (tel: 01433 620679). If it’s jewellery or gifts you’re after, Castleton is undoubtedly the place to come – and if you’re after blue john stone, it’s the only place to find it. There are at least half-a-dozen shops strung out along the main road specialising in blue john jewellery, along with the kind of nick-nacks and souvenirs you can find in any tourist resorts. The Information Centre has its own gift shop, as do the caverns. There are a couple of interesting craft shops and some outdoor equipment specialists too: the Old Barn in Market Place, Castleton Outdoor in Buxton Road, and Safariquip at The Stones. Also at The Stones is Carlton Emporium, a gory hole of antiques and junk. Hawkridge is a second-hand and antiquarian bookshop with a stock of around 30,000 volumes. One of the two rooms is dedicated to natural history, specifically ornithology, but the other carries everything from antiques to zoology – the perfect place to get lost in a book or simply while away a wet afternoon. Castleton is home to a wide range of holiday accommodation. Choose from the large selection of bed and breakfasts, holiday cottages, pubs, hotels and campsites in the Castleton area. See the full list of Castleton accommodation where you're sure to find something suitable. Main car park adjoining the Visitor Centre, Buxton Road; around £1 per hour or £6 per day. Car parking also available at Peak Cavern; limited roadside spaces available. Corporate Services of Hope 01433 620 525.